This experiment officially began in earnest on the day my five-year-old insisted on painting my toe nails in two colours. I wasn't convinced, but she pointed to her own colourful toes. "Mama, don't my feet look cute?" How could I say no? I embraced her and from there started my journey of being groomed by my child. Not only did this give me so much pleasure at a personal and maternal level, it also made me realise how much unnecessary emphasis we women give to body image and appearances. Her school was out and my blog had technical problems so I needed some time to fix it. This led to a small experiment that has now become a pleasant habit and a sweet bond. Since I needed time to work on my blog, I handed over my make-up stuff to my daughter to occupy her as I tinkered on the computer. My collection was not very impressive since I'm not a make-up person: just a few lipsticks, lip-gloss, kohl, eyeliner and nail paints. My daughter, who is not even five yet, is very fond of nail paints and tattoos (just watercolour ones for now!). She is also ever-ready with a ball pen to scribble "dear mama/papa" as well as various designs on her parents' hands. Well, so that day I handed over all the Barbies to her and asked her to do their make-up. She happily spent a day fooling around with the dolls. The next day I handed her my make-up and the dolls again, but she had other plans. "No dolls Mamma, I want to do make up on your face." To this I said, "No way, I'm very busy today." But she persisted. "You keep working on the laptop. I will not disturb you. I'll just put on the make-up." We went on in like this for a while, but she wouldn't give up. Finally, I gave in. There I sat in front of the laptop, while she applied gloss to my lips. She also brought a mirror for me to look at myself. I was not interested in what she did as I badly needed to work on the blog, but I praised her efforts. Little did I know that this encouragement would help foster a new hobby. Her school was still off and my blog was finally fixed so I decided to play with her and her make-up techniques. We did this fun activity for many days in a row, often clicking pictures of the results as we went along. Like yesterday, when I went for my sixth wedding anniversary dinner, she insisted I take out few strands of hair in front of my face because she thought it made me look "cuter". I gladly obliged. By now, she'd been grooming me for my public appearances for a while. Here's how the first few days went. This experiment officially began in earnest on the day she insisted on painting my toe nails in two colours. I wasn't convinced, but she pointed to her own colourful toes. "Mama, don't my feet look cute?" How could I say no? I embraced her and from there started my journey of being groomed by my child. Not only did this give me so much pleasure at a personal and maternal level, it also made me realise how much unnecessary emphasis we women give to body image and appearances. I went out to the market with these colourful toes and I felt happy. My feet did look better and "cuter" I thought. And nobody else seemed to care that I didn't have perfectly painted and matching toenails. I had to go to her school to deposit her school fee and to buy her new school uniform and books. 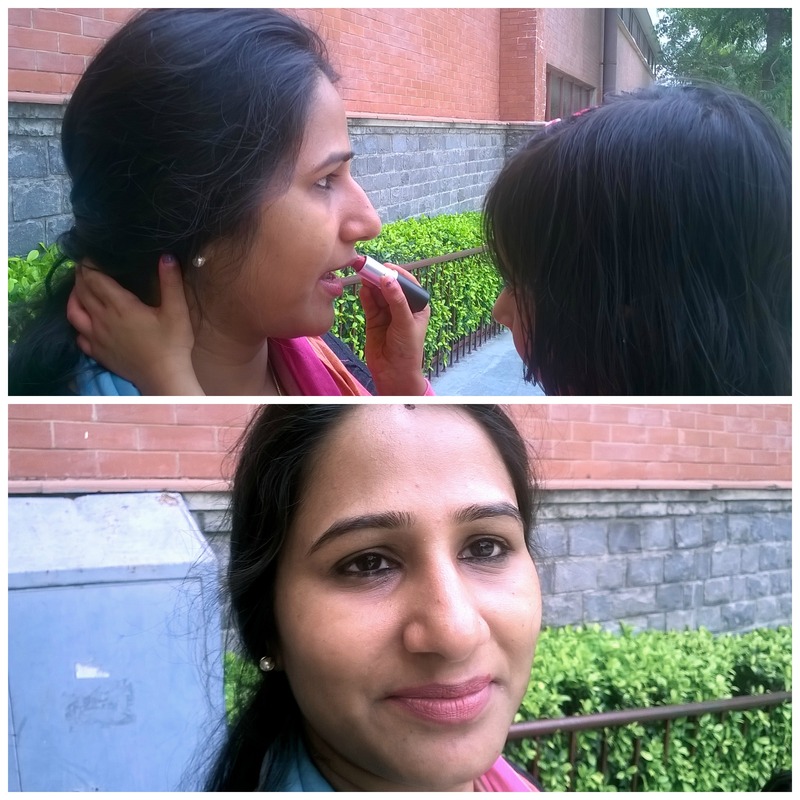 Right before entering the school premises, my daughter remarked, "Mama, you forgot to wear lipstick!" I had actually put on a dash of gloss but it had faded so I pulled out my Mac Ruby Woo from the clutch and began to apply it. My daughter stopped me. "Can I do it?" I balked because I was going to be running into other parents, but she asked so sweetly that I couldn't turn her down. Can you see the red smudging past my upper lip? That's my daughter's art. I went inside the school with the same lipstick. A woman looked a little intently at my face but that was it. I met an acquaintance on the way, we greeted each other. She smiled, clearly noticed the lip colour but didn't remark on it. By now I was enjoying having my daughter on board as my make- up artist. This day I had to go to buy groceries. I asked her what colour of lipstick would suit me today. She answered, "Brown, since you are wearing a brown tunic." I handed my Oriflame brown lipstick to her and she gladly did her job. Just that this time she sketched it outside the lower lip. It looks like as if I have applied liner well below the lower lip and forgotten the lipper. I went to the grocery store, interacted with the sales woman there, smiled with my uneven lips, and bought what I needed. No one said, noticed or pointed out anything. I was now totally comfortable making my face a canvas for my daughter's artistic hands. I decided to be a bit daring and asked her to use kohl on my eyes for the first time. She did very well for her age though I did look a bit like a raccoon. She painted my nails in one, single colour, but refused to fill in the nail on my index finger. 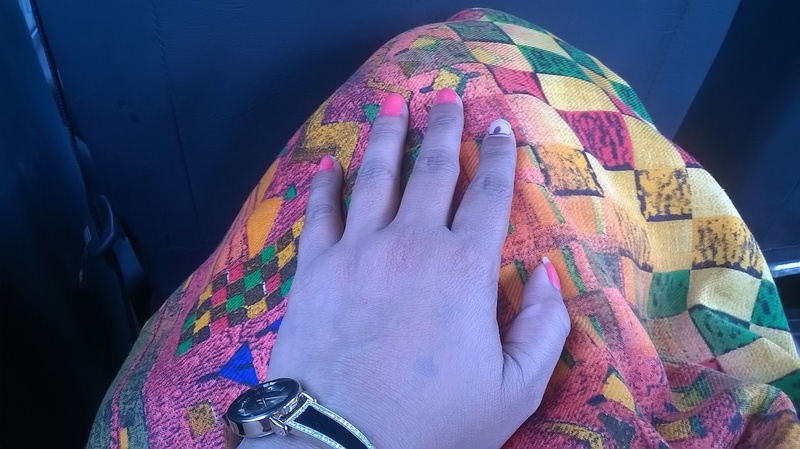 "Mama, that nail has a mark. If I put colour on it, the mark will not be seen." Finally, she applied vermillion on my forehead. The vermillion line is way longer than it should be. I generally put a small dot on my forehead right below the centre partition. This day I went out to buy a dress for my baby from a nearby market. Again, as expected, no one noticed or said anything. No one made fun of me. Our sessions continue. She sometimes dresses me up and does my hair but I do not document it. This is not an experiment any longer, it is a sweet mom-baby play time with each other. This little exercise has taught so much to me as a woman. While I roamed in the market with smudged kohl, smudged lipstick and childishly painted nails, I was the one who noticed my own make-up. No one else cared about my lipstick, kohl or the nails. So many of hours take hours to get ready every day because we are so afraid of being judged for our imperfections, our clothing, our make-up, our body. The fact is that most other people just do not even notice these things. We need to just be, relax, have fun. I had an awesome time with my daughter who was so pleased that she got to play the controller and reverse roles with her favourite person. She could control my looks, make-up and my outfit. She feels accepted and loved when she asks me to do a certain thing and I willingly do it. As a girl, who will grow up to be a woman in an even more competitive world, I want her to understand that beauty standards are bull sh*t. Personality is what matters. Looks are all about the perceptions of other people. They don't have that much to do with who you are. I also want her to know that there is no "right" way to look. She smudged my lipstick but I didn't try to fix it. I still looked beautiful to her and I was still me. 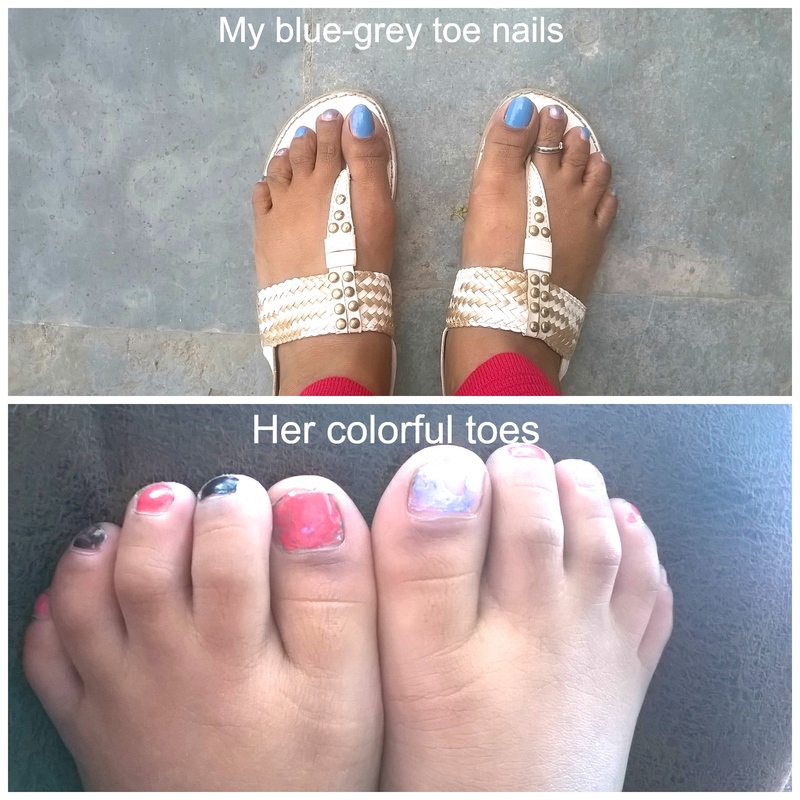 She painted my nails in different colours and it only made me a little more cheerful. The only criterion of beauty is the one that we set. If we don't set a standard, there can't be one. I want her to accept herself fearlessly when she grows up without any prejudices, feelings of inferiority and complexes. I wish her to become a woman confident of herself who can walk around with her heart on her sleeve, not giving a damn about what others think about her beauty or looks. She can be what she wants to be and she can look the way she wants to. I hope I set a good example with this "experiment". A version of this post originally appeared onWomanatics.